An Oct. 8 special report from the Intergovernmental Panel on Climate Change gave the planet only until 2030 to stem catastrophic climate change. This leaves only 12 years to limit the catastrophe and defuse a future of extreme weather and displacement of millions. This report came out when drought, flooding and massive wildfires were striking across the globe. As if to underscore its findings, a few days after the report was released, Hurricane Michael made landfall as the first category 4 hurricane on record to hit Florida. Other scientists have pointed out that the earth is undergoing its sixth mass extinction event, affecting all life, from plants and insects to mammals. What never seems to be discussed in corporate climate-change reporting is collective and anti-capitalist solutions. This is both absurd and unsurprising. The establishment media is just that—the mouthpiece for the capitalist establishment. The same bourgeois drive for profit that ascended globally with capital and its CO2 emissions is the same bourgeois drive for profit that tries to limit the scope of possible solutions to personal lifestyle changes. The scale and complexity of the climate problem, and the immense and inescapable responsibility to confront it collectively, can make one feel hopeless. For those who are concerned and inclining toward action, the uncertainty and noise in the media can make it difficult to know where to begin. But much can be done. For example, the real polluters can be exposed and held accountable. There are 90 to 100 companies that are responsible for over two-thirds of greenhouse gas emission since the 1850s – companies like ExxonMobil, BP, Chevron, and Saudi Aramco. Not discussed at all in this media is the pragmatic necessity of expropriating the wealth that corporate giants gained at the expense of life on Earth. These companies and their executive boards need to be held accountable and responsible for paying full reparations and fund sustainable development. While fighting to expropriate the giant polluters, a sustainable ecology can be developed. 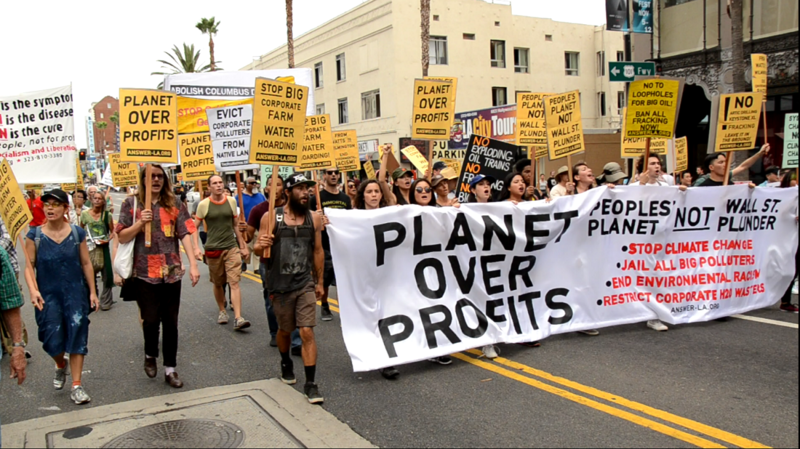 Across the globe, networks of activists and organizers are taking matters into their own hands and developing and implementing sustainable alternatives. International coalitions like the New Economy Coalition and the Climate Justice Alliance are doing what states and corporations refuse to do – explore sustainable energy alternatives. In Puerto Rico, after the devastation of Hurricane Maria and the refusal of the U.S. government to extend adequate aid, the people are proposing a people’s recovery process to rebuild the island in the interest of Puerto Ricans. This would include food sovereignty – small farmers using ecological methods to grow food on the island instead of importing it. It would include shifting to a decentralized, community-controlled model based on renewable energy, rather than privatizing Puerto Rico’s electric grid. In Jackson, Miss., Cooperation Jackson is a solidarity economy. It fights to decommodify land through Community Land Trusts and start sustainable housing cooperatives as part of a comprehensive plan for racial and economic justice. In Cincinnati, Ohio, unions are developing sustainable cooperatives. New York Renews, an umbrella of organizations in that state, connects the fight for labor rights and job creation to the fight for 100 percent renewable energy and justice for vulnerable communities. The Climate Justice Alliance, a national organization advocating Just Transition strategies, points out that energy democracy is important for the self-determination of a community. It affirms the autonomy of indigenous peoples and the practices they institute to maintain a balanced ecosystem, and can be used to combat environmental racism and enact reparations to minority communities disproportionately impacted by the extractive mechanism of capitalism. In New York, experiments in energy democracy are underway. The New York Energy Democracy Alliance is working to ensure that all New Yorkers, regardless of race, income or neighborhood, have access to solar power. The Northwest Bronx Community and Clergy Coalition helps tenants reduce asthma episodes by repairing and upgrading multi-family buildings. Their Healthy Buildings Program takes a holistic approach to eliminating asthma triggers, reducing energy costs and greenhouse gas emissions, and investing in community jobs and contractors. In Buffalo, People United for Sustainable Housing mobilizes residents to fight for economic and environmental justice and control. Madden continued: “Trade Unions for Energy Democracy provides an international model for how unions can encourage and facilitate self-determination through action on climate to address land grabs, energy poverty, and pollution. They are a multi-sector initiative focused on building worker power to combat the power of fossil fuel corporations, tackling investment and policy questions around a just transition to a 100 percent renewable energy economy.